With a lot of pride, a ton of teamwork and a touch of humor, officials Tuesday unveiled a new recycling plant that began pumping water from San Rafael’s Las Gallinas Valley Sanitary District to irrigate schools, parks and fields in Novato. 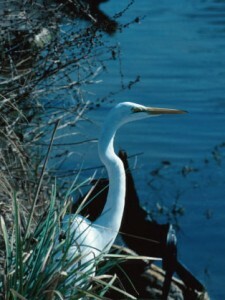 The $8 million, 5,000-square-foot plant will recycle wastewater from the kitchens and bathrooms of the Las Gallinas district, which includes north San Rafael and Terra Linda. In a partnership with the North Marin Water District, the Las Gallinas district built a $5 million purple pipe to distribute the recycled water to the Hamilton Field area of Novato. 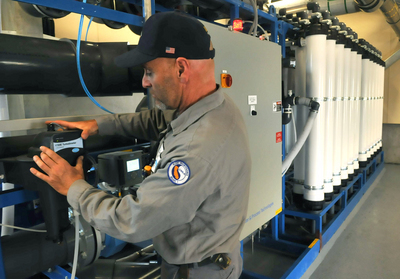 “We’ve realized a pipe dream,” said Chris DeGabriele, general manager of the North Marin Water District, to applause and a few chuckles at Tuesday’s dedication ceremony at the treatment plant. The pipe that will carry the treated water is purple due to federal standards that stipulate that color so that it will be immediately evident what type of water is being conveyed. The project was 10 years in the making and about three years in the building, said Mark Williams, general manager of Las Gallinas Sanitary. 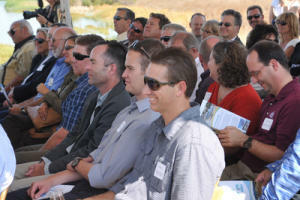 “Three years, two grants and two loans later, we have a recycled water plant and distribution system,” Williams said. The money for the plant came from federal and state grants and a $6.6 million loan from the Bank of Marin. The money for the $5 million pipeline came from federal and state grants and a loan from the state. Under terms of an agreement between the two districts, North Marin will pay operating costs of the recycling plant; the projected costs were not immediately available, but officials estimated the total would be less than $50,000 the first year. Moore noted that because North Marin will be using recycled water to irrigate, it is freeing up drinkable water that would otherwise be used for watering. 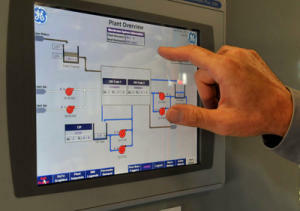 “It (the plant) will make 45 million gallons of water annually to be distributed in the Hamilton area,” Williams said. The pipeline from San Rafael to Novato is 2.5 miles long and took about nine months to build, DeGabriele said. Larry Loden, a Las Gallinas Valley Sanitary District board member, regaled the crowd of about 100 board members, district officials and employees, politicians and others with tales of the infamous California drought of the mid-1970s. “During the drought, if you used too much water, they came to your house with a sledgehammer and broke your water meter,” Loden said to laughter from the audience. Living through the drought (and the fact that his wife’s roses did not) made Loden realize the importance of conserving water, he said. Loden said his district intends to recycle more water, a sentiment echoed by Williams. Is recycled wastewater the answer in Coombsville?